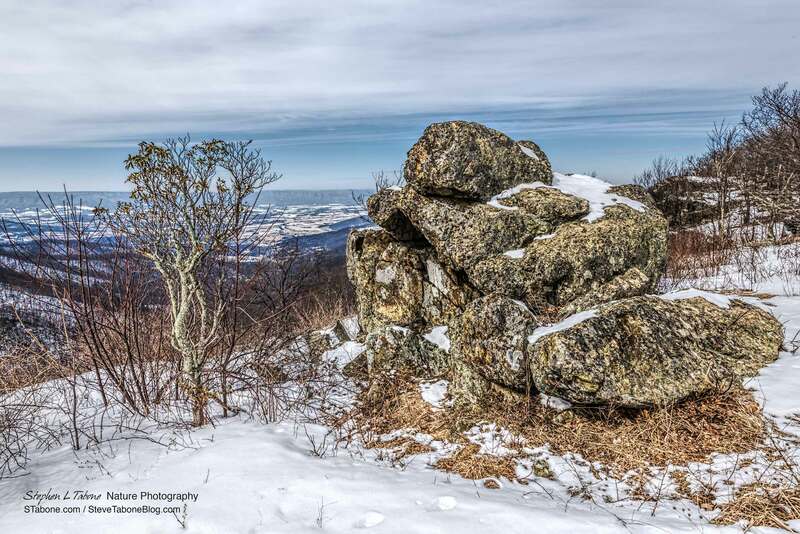 Yesterday, after dropping my son-in-law off at Massanuttan Resort to go snowboarding, I spent the day in Shenandoah National Park, exploring and looking for either wildlife or an eye-catching view that I could make into a “keeper” landscape image. I only briefly saw a few small birds and heard a Barred Owl in the distance. It turned out not to be a good day for photographing wildlife. 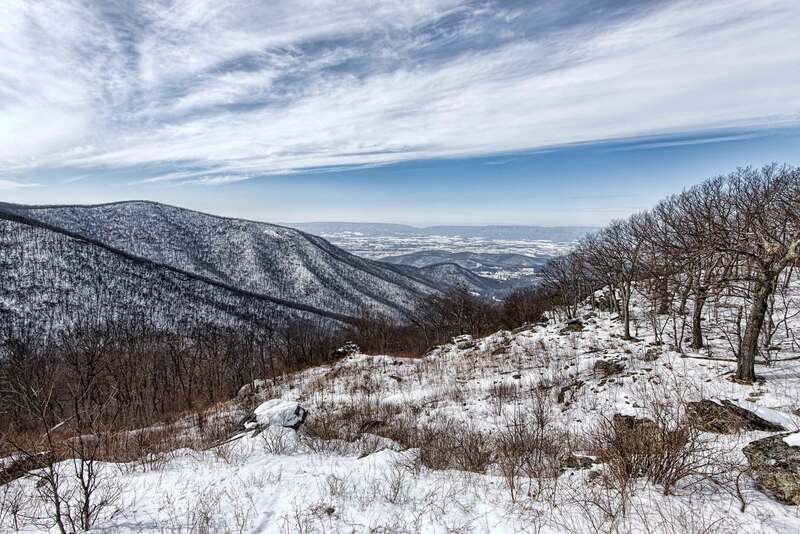 Since it snowed earlier in the week, I hoped to capture an image of the snow on top of the mountains with a view of the snow below in Shenandoah Valley. I searched for a couple of hours until I found what I was looking for, as shown in the opening image. I located a group of large boulders covered and surrounded by snow at the top of a mountain with a clear view of the valley below. And, Mother Nature/the weather was cooperating. It was 22 degrees, and fortunately, the wind was not blowing, keeping everything still. To further enhance the image, a weather front was passing through, providing an interesting semi-clouded and blue sky. One way to make a landscape image interesting and to give it depth is to photograph something in the foreground, while capturing the overall landscape in the background. As you can see in the above and below images, I moved to different locations around the group of boulders to capture different perspectives. Below are two different views. Although I like the two above images, the opening image is my favorite. I like that the boulders are off-center, and that the clouds, blue sky and terrain provide leading lines to the subject of the image. In the second image, although also appealing, the boulders are in the middle of the frame. From a photographers perspective, I try to avoid placing the subject in the center. In the third image, I included a small tree to the left of the boulders, which adds interest to the image. However, the tree blocks the view of the valley. The images were photographed with a Nikon D810 and 16-35mm wide angle lens. The detail captured by the D810 is incredible. I suggest clicking on the images to see them in full screen mode. I included the above image as an example of the need to have something of interest in the foreground of a landscape image. Although this image is interesting, showing an unobstructed view down the snow covered slopes of the mountains to the distant valley, it is not as appealing as the above images with the boulders. 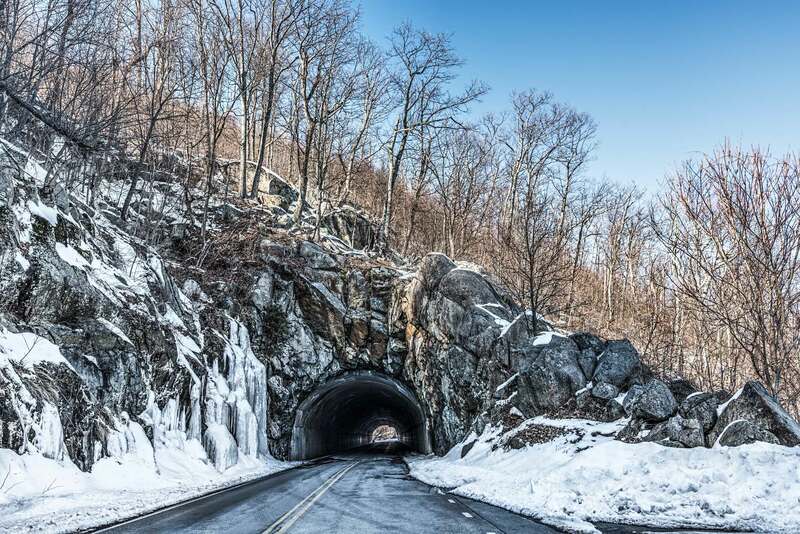 Below is an image of Mary’s Rock Tunnel in Shenandoah National Park. It is the only tunnel in the park and was excavated through solid granite in 1932. It is considered one of the engineering feats of Skyline Drive. I have always enjoyed seeing and driving through the tunnel. I just had to stop and photograph it as I was leaving the park to pick up my son-in-law at Massanuttan. I bracketed the below image and processed it using HDR software. By bracketting, I captured the tunnel at five different exposures so that in post-processing I could retain the detail in front of the tunnel, as well as at the end of the tunnel. Without bracketing and HDR, or some other method of blending images, either the view at the end of tunnel would be blown out/lacking in detail, or the boulders at the entry of the tunnel would be very dark/lacking in detail. 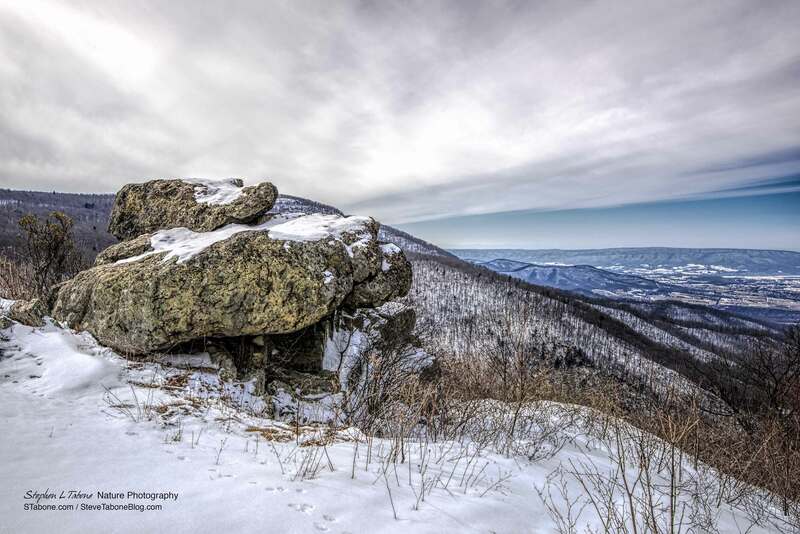 This entry was posted in National and State Parks, Nature, Shenandoah National Park and tagged Shenandoah National Park, Skyline Drive, Snow covered mountains. Bookmark the permalink. I was wondering what the park would be like in the snow. Thanks for sharing! Beautiful photos! Another great post! I like that you shared your creative thought process in deciding how to shoot your subject. I also agree that the first shot is the most interesting and pleasing. Lovely Stephen!! I haven’t been in the park in the winter in years!! 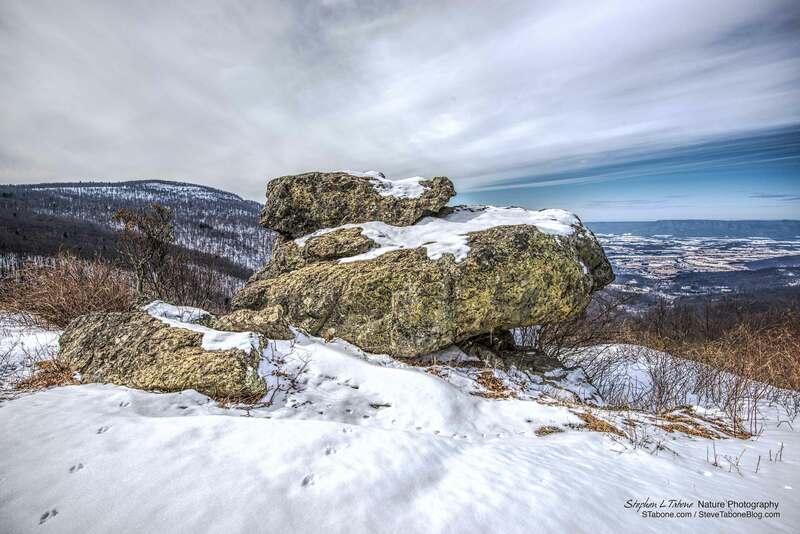 Enjoyed your photos of the snow covered Shenandoah mountains. Haven’t been out there in a while since the last child graduated from JMU. I don’t think I have been through the tunnel, of course my memory sometimes fails me. Absolutely gorgeous shot of the tunnel. Love reading your thought process for photo selection and what makes a good photo! I think you should become a professional photographer. After you retire.